Learn how to make spiral knot, the most basic knot used in friendship bracelets. Cut pieces of cord to the desired length. (Recommended lengths: Bracelets 7 ½ feet, Choker Necklace 15 feet, anklet 10 feet.) Fold the strand in half and tie the folded ends into one knot with a small loop. Now you have one big knot and 2 strands of cord. Clip knot under clip of clipboard in order to secure the bracelet for crafting. Separate the two strands. You now have a left hand strand and a right hand strand which will be referenced in the below steps. A true spiral knot is made when one strand is wrapped in a certain way around one or more strands throughout the length of the jewelry piece. You can make them as forward and backwards in direction. 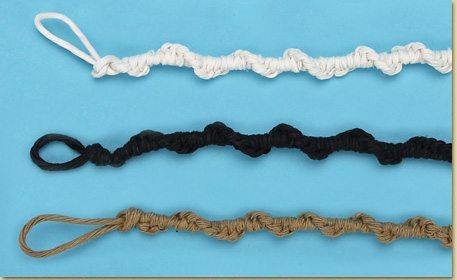 Let’s review the forward spiral knot. Take the left hand strand and cross over the right hand strand, leaving a loop. Take the end of this same left strand and pass under the right hand strand. Pull this same left strand through the loop created in step 4. While holding the right hand strand tight, pull the left hand strand to form the knot. You have just made your first forward spiral knot! To continue to make your jewelry creation, repeat steps 4-7. When repeated, a spiral shape will form around the right hand strand. It may be helpful to reposition and re-clip your knot on the clipboard as you create your project to always keep the left hand strand on the left side and the right hand strand on the right side. To see instructions on a finished spiral knot bracelet example, click here!